Special editions are a car company marketing department's ace-in-the-hole when they need to juice-up sales, mark some special milestone such as a major win in motorsports, an anniversary of a model's introduction or to honor someone with a special connection to the product. Corvette special editions have been a fixture of the marketing of America's Sports car ever since the first one was released forty years ago. Corvette Special Editions, by Keith Cornett, tells the history of virtually all Corvette specials as well as covering selected limited production models and a few significant, aftermarket uplifted or "tuner" cars. Back in the mid-90s, Cornett founded the ground-breaking VetteFinders.com, the first Corvette-only classified ad site. A decade later, he started CorvetteBlogger.com. With those two businesses, along with his long association with the National Corvette Restorer's Society, Cornett has amassed a heck of a lot of knowledge and information about America's Sports Car. He has done the hobby a service by writing a book about a topic about which many Corvetters are interested but which there are few books as comprehensive as is this title. 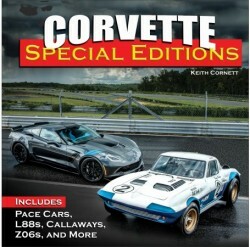 The 192-page hardcover book details 53 different special editions, limited production or tuner Corvettes–everything from the first special, the 1978 Twenty-Fifth Anniversary Edition, to all six Indy Pace Car replicas, the commemorative and tribute cars along with limited production offerings such as the L88 and the first ZR1 of 1970. The book is profusely illustrated with 400 images, many of which were shot by the author. Most of the subject cars are fairly well-known in the hobby but some are not. I was surprised to read in this book about the 2007 "Victory Edition" Corvette which was available only in Europe. I was, also, unaware of two 2015 "Design Packages" the "Atlantic" and "Pacific Stingrays." Indeed, Cornett's book has some educational value as well as being a pleasant read. Probably the most interesting content of the book covers the proliferation of Corvette specials in the C6 and C7 era. From Cornett's writing, it's easy to see that the folks at GM tasked with marketing America's Sports Car aggressively supported Special Editions as a tool in promoting the brand throughout a Corvette's "generation", not just as a way to mark an anniversary or a platform change-over. My Wife, the Fairest Sandra the Red, and I own 2004 LeMans Commemorative ZO6 so, the first thing I did with Corvette Special Editions was to open the book to a subject I knew well: the '04 LeMans Editions. On page 56, there it was in the section's first picture–"our" '04 LeMans ZO6. In the photo caption I read read that all LeMans Commemoratives came with Shale interiors. I thought: Wait, what? That's not right. Coupes and Convertibles were Shale but ZO6es had black interiors. The text following that image has it right, but still–that errant photo caption is confusing and should have been fixed at the proof-reading stage. That night, I started from the beginning and only four pages into the book, reading about the first Corvette special, Cornett states that the '78 Twenty-Fifth Anniversary cars had a redesigned three-speed manual transmission. WTF? Three-speed sticks went out of production in 1969. It's possible the author meant the Turbo Hydra-matic 350 automatic which was new on Corvette for '78, but that should have been fixed in proof-reading, too.Then, in the section on the '88 35th car, aluminum heads were described as an improvement for 1988. Actually, they were introduced mid-year 1986. Three pages later, I saw a photo of a '93 40th car and read its caption which said that one-out-of-three 1995 Corvettes were 40th Anniversary Editions. That's only off by two model years. Another oopsy is in section in the Indy Pace Car chapter on the '08 Replica. It says the LS3 engine, new that year, had a lower compression ratio which allowed use of E85 fuel. Actually, the lower compression ratio was a function of the LS3 and the L92 truck engine using the same cylinder heads. Plus, the LS3 was not a flex-fuel engine and, thus, could not run on E85. Limited production Corvettes have a chapter near the end of the book and, obviously, one of the most historic of those are the '67-'69 L88s. Sadly, the three-and-a-half pages devoted to that milestone Big-Block Chevrolet engine contain several errors. One would have thought a book by the Corvette Blogger would not have such mistakes. Unfortunately, inaccurate statements and proof-reading errors are all too common in Corvette Special Editions. While the book is noteworthy for its easy-to-read style, that it encompasses all Anniversary Editions, Indy Pace Cars, specials, commemoratives, tributes, limited production and tuner Corvettes and showcases some great photography, its credibility takes a hit because of some examples of poor research along with inadequate proofreading by the author and his publisher, CarTech. For more information or to order, see the CarTech web site.